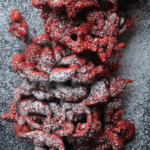 Red Velvet Funnel Cakes: Classic funnel cakes get a fun red velvet twist! It’s snowing! It has been a long time since I felt the excitement associated with winter. Last winter in Chicago was rough to say the least. There were moments when I wanted to pack up and leave immediately. This year, I realized that I needed to approach winter with a childlike joy and bewilderment that I experienced when I was younger. 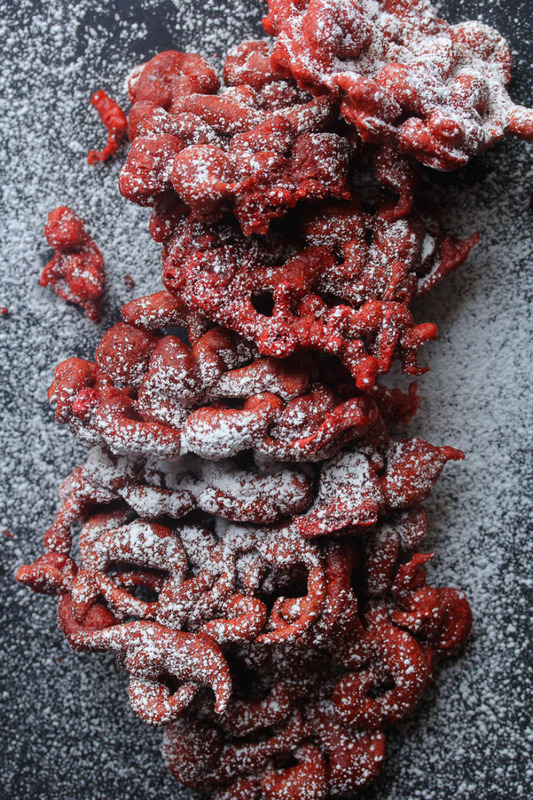 In some strange way, that approach led me to making these red velvet funnel cakes. When I was younger, I would stare out of my window for hours watching the delicate snow fall around me. It was magical. I remembered how much it reminded me of sifting powdered sugar when I played in the kitchen with my mother. I wanted to duplicate that enjoyment, and I realized that sometimes it can be as easy as sifting powdered sugar over delicious funnel cakes. I know funnel cakes are a bit bizarre to blog about during this time of year, but why not? What’s wrong with frying some dough and eating it? Just because it’s cold outside doesn’t mean you can’t enjoy a summer treat. I gave it a holiday twist so it would not seem too out of place in your home. 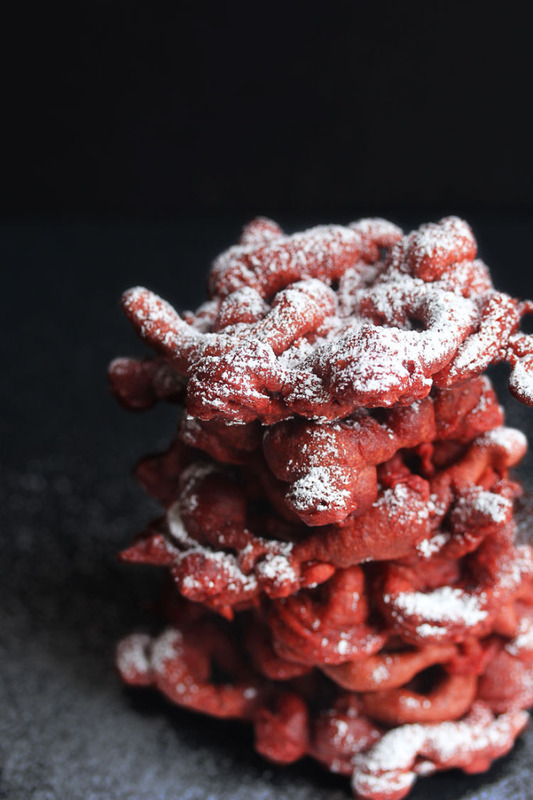 I simply added some cocoa powder and red food coloring to this funnel cake recipe (and I even replaced the milk with eggnog for more of a holiday feel), and the rest as they say is history. These were so much fun to fry up. I loved how much the color popped! It actually inspired me to be a bit more unconventional in my blog offerings. I like to do what is unexpected whenever I can. And of course my favorite part was getting my snow on with the powdered sugar. Let’s just say it brought out the kid in me. Delicious Funnel Cakes get a holiday update with red velvet flavor. 1 1/2 cups milk or eggnog for something more festive! Whisk together flour, sugar, cocoa powder, baking powder, and salt in a medium sized bowl until combined. Next whisk in wet ingredients: milk, eggs and vanilla extract until the batter is nice and smooth. Add red food coloring as well and whisk until it is the color you want it to be. WOW. So fun. I totally agree – no need to wait until summer for fried dough! What a fun time right Andrea!!?? What a fun twist on red velvet!! Good thing I was already sitting down when I saw this… because I nearly fainted. This is epic!!! Red velvet funnel cakes!!! Give me!!!!! Awww thank you so much Cailee! The memories make it more tolerable now! I puffy heart luurve these little funnel cakes! 🙂 They look irresistible! Oh my goodness, those are GORGEOUS Jocelyn! Yum! These red velvet funnel cakes look beyond delicious Jocelyn! Pinned! I love watching the first snow fall too. There is something so mesmerizing about it! And powdered sugar has the same affect 🙂 These funnel cakes are the perfect mix up from all the cookies and frosting going on this time of year – pinned! Thank you Mary! I agree about how magical the first snow is! That snow on these cakes is ALL the snow I want! Cannot stand the other one. These are pretttttttyyyy! Agreed. That’s about as close to loving snow past Christmas as I am going to get. I think I’d like the snow…for one day. 🙂 These are GORGEOUS! Yep just one day girl. No more. Super fun for Christmas morning!! These little lovelies and I are going to have to come to an agreement about how many will end up on my thighs! Yeah I wish I could have called a truce before devouring mine. OMG. 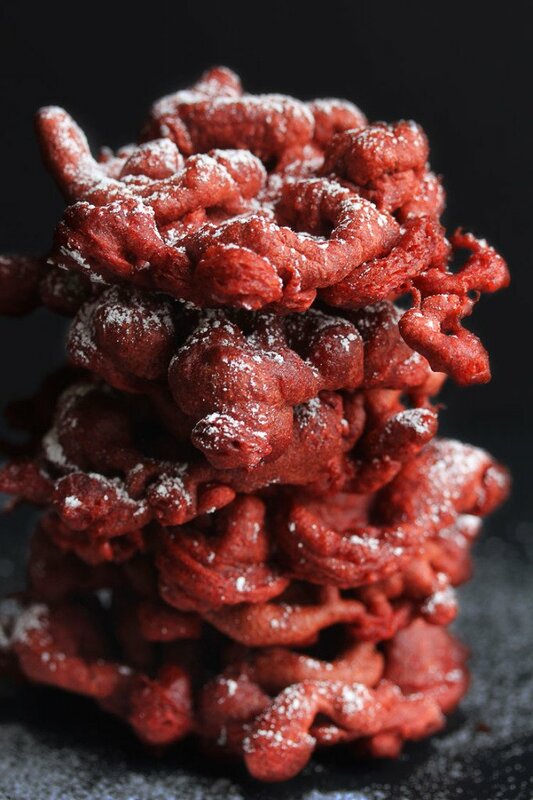 I have not had funnel cakes in ages but now I want them…and they have to be red velvet funnel cakes. LOVE this, Jocelyn! Hooray they are super fun for the holidays right? Awww thanks Leah! Gosh I bet it is hard sometimes though I wish I had your problem last year. Funnel cakes are NEVER bizarre Jocelyn 🙂 Especially these fabulous red velvet ones! Pinned! Say whaaaaaat? These are AMAZING, girl! These are SO fun! I was strangely excited about winter this year, too — I’m not usually into all the cold but I waited and waited impatiently for snow this year! Oh wow girl come here to my neck of the woods and you will get plenty! No you did not! I love funnel cakes and these look oh so good! It’s a red velvet week! I just posted something red velvet-y too! You are gorgeous and cunning in this lovely variation. It makes both foods better to combine them like this! Woot woot to Red Velvet Week my dear!!! Purrrrrfect for Xmas. Who says they are summer only cakes. You have proved that theory wrong. Everybody loves funnel cake. I like your comparison with the magical feeling of falling snow. Made me smile. Agreed funnel cakes may be the way to properly deal with the snow. lol…I’m sure the powdered sugar was the funnest part. These are very festive and pretty! Yep that was definitely fun! My son had funnel cake for the first time this summer at our town pool…and it was hard pulling him away from that plate! This red velvet spin is very creative! I love it all! Funnel cakes are totally acceptable in December, especially red velvet ones with eggnog – yum! oh my gawd, I love funnel cakes!!! and you made red velvet ones!!! love love love!!! These remind me of the BEST kind of sweet treats!! Yes they really are Alice! Jocelyn, there is not a darn thing wrong with frying up some dough 🙂 I adore funnel cakes and love this red velvet spin! I’m glad that it’s early enough in the season that we can enjoy pretty snow (and hopefully it won’t be as terrible as last year)! I know. I am trying to prepare my mind for the winter ahead. Now this is funnel cake! Love this idea! Hahaha thanks so much Annie! So fun Jocelyn, my sons would go crazy for this!! I think funnel cakes bring out the kid in everyone right? So fun! Stunning! 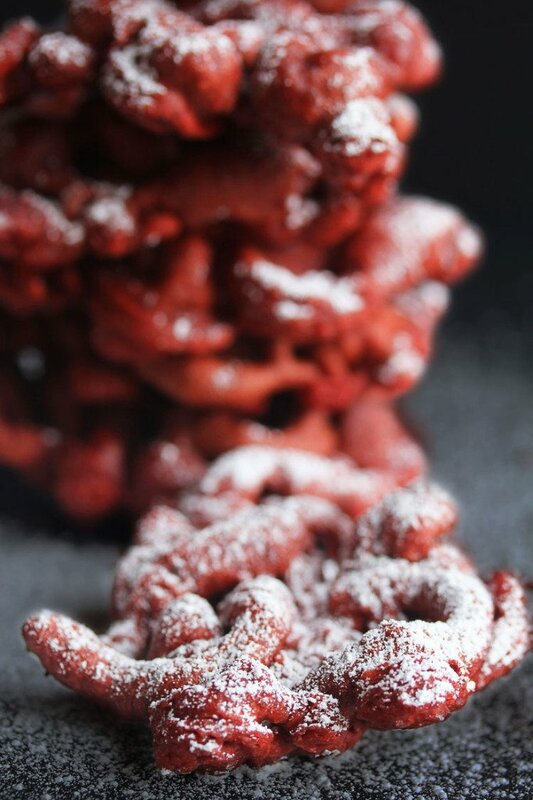 The idea of red velvet funnel cakes is so fun and festive. Such a great way to cheer up this cold gloomy weather! Agreed. I definitely needed some cheering up too! They do look kinda like snowflakes haha! Oh I could totally get down with these. There is NOTHING wrong with frying up dough and topping it with sugar. Absolutely nothing. Loving your blog, btw! Pinning alllll the things. Aww thank you so much Sarah! I adore your blog too! Wow! I didn’t think funnel cakes could get any better. I absolutely love this idea! You’re a genius girlfriend! Woot woot! Love funnel cakes! My family always makes funnel cakes on Christmas Eve, but we have never made red velvet. We definitely need to try this recipe this year! Yes red velvet is a fun twist for sure! Ohhh I love this twist on funnel cake!! Looks so good!! I really need to try making funnel cakes at home..this is so fun! Agreed! It feels good to be positive about it this year.